I was again honoured to be asked to guest on local radio station Wycombe Sound – this time by Andy Aliffe for his ‘Emperor’s Bits’ show broadcast on Wednesday 21st February 2018. 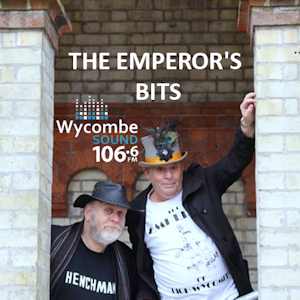 Andy, assisted by his friend Stevyn Colgan, launched the show earlier in 2018, with the website description claiming : ‘The Emperor’s Bits’ is an eclectic mix of music and chat and looks at the quirkier side of Wycombe history. It is not wrong! I was extremely grateful to be called in to promote the wycombegigs.co.uk website and also give from some background to High Wycombe appearances by a few of the iconic artists featured to date – including The Rolling Stones, The Who, David Bowie and The Move. It was also amazing to share the studio with fellow guest Barbara Arucci. 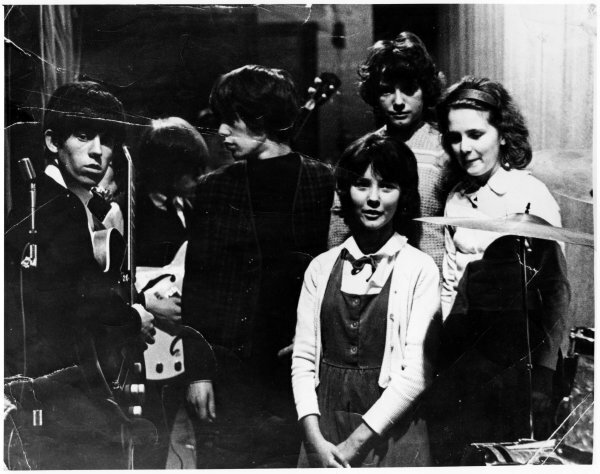 Barbara attended The Rolling Stones gig at Wycombe Town Hall in December 1963 aged just 13 and was lucky enough, through a family connection, to be allowed backstage with members of the group. A photo of this meeting appeared in the Bucks Free Press and an original survives as a prize possession of Barbara until this day. 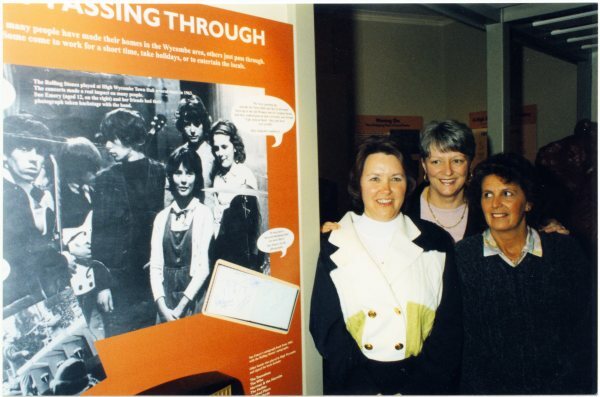 Back in 1999, Barbara and her friends were invited to attend a re-launch of Wycombe Museum in Priory Road, where a blown –up version of the photo was proudly displayed. It was fantastic to hear from somebody who was actually at these great moments in the history of the town and her recollections of other music venues. 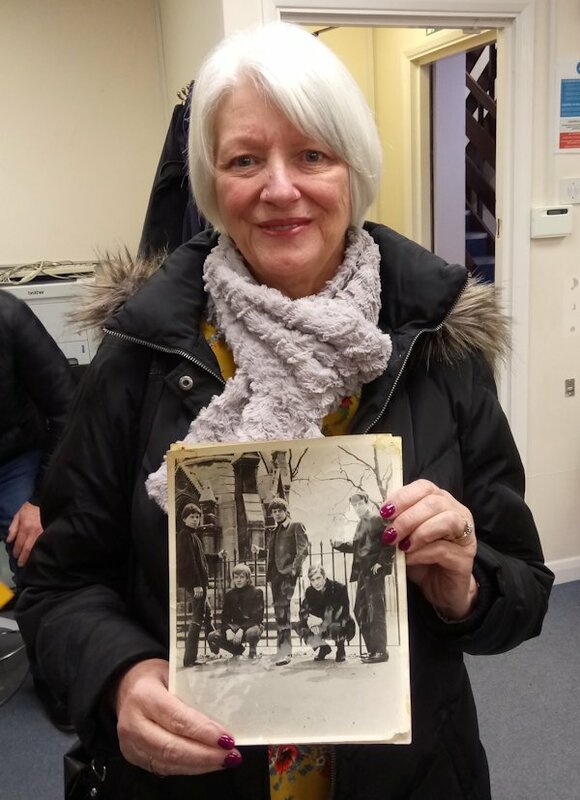 Barbara also brought along another picture of The Rolling Stones, with a complete set of autographs on the rear – including the sadly departed Brian Jones. Barbara in February 2018 with her treasured signed Rolling Stones picture. An enjoyable hour or so in the company of Andy and Stevyn. Both gentlemen can boast an fascinating history of working in all manner of walks of life – Andy spent 20 years with the BBC, Stevyn spent 30 years working for the Police in Cornwall but has more recently worked as researcher on the QI TV show and also written several books. You can read more via the link at the foot of this page. They warned me I might be invited back to track through memorable music moments from the 1970’s, 1980’s and beyond. So keep an eye and ear out for that and tune in for an hour of random fun. You can use the ‘listen again’ feature on the Wycombe Sound website to hear the show again for up to a month after the original broadcast date. Tuesday 17th December 1963 saw The Rolling Stones play their third gig of the year at High Wycombe Town Hall. Formed in London, they had played their first ever gig at The Marquee Club in July 1962 and subsequently signed for Decca Records. Their first single, released in June 1963, was a cover of Chuck Berry’s ‘Come On’ and reached No.21 in the UK charts. They made their High Wycombe debut at The Town Hall on 13th August 1963, with a second single following in early November 1963 – this time a Lennon/McCartney penned ‘I Wanna Be Your Man’ becoming a ‘slowburner’ and eventually peaking at No.12 in the UK charts in January 1964. The song had the honour of being the first shown on BBC’s Top of the Pops show broadcast on 1st January 1964. Before then, they had time for two further appearances in High Wycombe – a 12th November 1963 showing followed by the 17th December 1963 pre=Christmas bash where the advert in the Bucks Free Press included the added draw of seeing a ‘selection of MISS HIGH WYCOMBE’. Admission was 7/6 (37 ½p). A picture taken backstage showing Mick Jagger and Keith Richards is archived on the SWOP site. It’s worth recalling the ages of the band members at the time of the December 1963 gig. Vocalist Mick Jagger was 20, Guitarist Keith Richards was just 19 but would celebrate his 20th birthday the day after The Town Hall gig. Fellow guitarist Brian Jones was 21, Drummer Charlie Watts was 22, while the oldest band member was bassist Bill Wyman at 27. 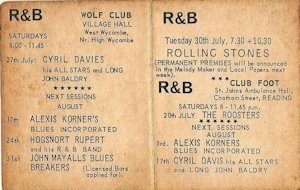 A 29 year old John Mayall and his Bluesbreakers play ‘The Wolf Club’ hosted at West Wycombe Village Hall. This was towards start of the Rhythm and Blues era in the UK and this gig appears to have been organised as part of, or on the back of, the embryonic stages of the famous Ricky Tick Club run by John Mansfield and Philip Hayward. I am indebted to Gary Jones for supplying the above gig flyer. Gary later worked with Ron Watts during his time promoting at The Nag’s Head in the late 1960’s. The flyer lists a series of R&B gigs in West Wycombe and Reading. You can also see from the flyer, a Rolling Stones gig to be played on 30th July 1963. This gig would eventually take place at the Royal British Legion in Slough under the curious banner of Club Nod. In between the first gig listed (Cyril Davies on 27th July 1963) and the Mayall gig, The Rolling Stones would make their High Wycombe debut with an appearance for the first time at the Town Hall on Tuesday 13th August 1963. That would be opening of the ‘Tuesday Dancing Club’ at the town centre venue – more about those nights in future posts. The West Wycombe appearance appears to be at a similar time that Mayall had moved to London from his northern roots in the Manchester area in order to take up a full-time career in music . The line-up for the West Wycombe gig is most likely to have included John McVie (bass) and Bernie Watson (guitar) and Peter Ward (drums) but comments are welcome. “After Britain’s ten year traditional jazz boom had about run its course, a new generation was ready for something new. Out came the amplifiers, guitars and harmonicas and out came young enthusiasts from all over the country eager to form their own groups.” That seems a pattern of events that would be repeated over time. There are a host of resources documenting Mayall’s musical journey and the huge list of musicians he played with following these early gigs. At the time of this post, the 83 year old was preparing for gigs at Ronnie Scott’s – some 53 years after his performance in West Wycombe!